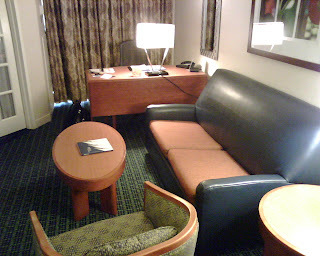 I recently stayed at the Hilton Suites Perimeter for three nights on business. The hotel and rooms are very well maintained. The grounds and lobby area are all very well laid out and clean. Check in was very easy and quick although this hotel does not recognize HHonors status for upgrades or amenities for some reason. The rooms are very nice with lots of space. There is a separate living area and bedroom. The living area has a sofa, chair, desk and coffee area. There is a plasma TV in the living room and conventional tv in the bedroom. There is a balcony off the living room where you can get some air which is nice. The work area is very functional and the wifi works well, although slow at times. The beds are wonderful, very comfortable with plenty of pillows. The bathroom has a separate stand up shower and bathtub. 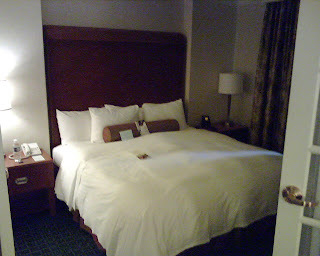 The room also came with a robe which is always appreciated. The only real downside to the hotel is the A/C doesn't cool that well so if you like a cold room to sleep in, which I do, this isnt going to work for you. Overall it was a very nice, not as nice as some of the other hotels I have stayed at in Atlanta but if they were not available I would consider staying here again, but would definitely choose one of my favorites first.